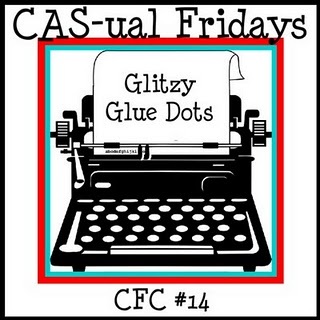 I'm back to share with you my submission for the CFC14: Glitsy Glue Dots. I took a little break from CFC among other challenges because I didn't feel very creative. Since my break - I have been brainstorming again for ideas. 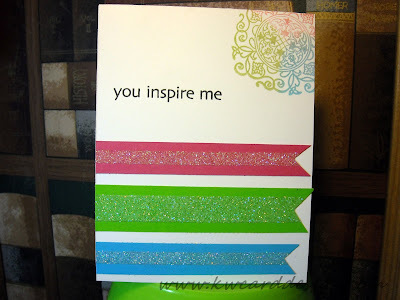 For this challenge the objective Add glitter to your Clean And Simple project using an adhesive Glue Dot or strip. I decided to use sticky strip. I knew I wanted color, color, color. I also knew I had two different sizes of sticky strip I could use. My card base is GKD heavy base weight white card stock. I took strips of other colored card stock from my scraps and put them to good use. I cut the ends to a banner shape, and added my sticky strip. The middle is the 1/2" size, and the other is the 1/4" size. I added some dazzling diamonds glitter to my strip, and my strips of color card stock comes to life with sparkle. Then I wanted some kind of medallion in one corner of my card, and took some of my cat eye inks and added the same colors to my medallion. My sentiment comes from HA - " You inspire me". I thought it was fitting since this is the first card from my "break" from all the different challenges. Hope you like it!! So glad that you are back in the game with this beautiful and bold card. The glitter is the perfect accent. Thanks for playing at CAS-ual Fridays!